The Federal Communications Commission is asking a judge to reject The New York Times Company's request for information about comments submitted to the agency in its 2017 net neutrality proceeding. 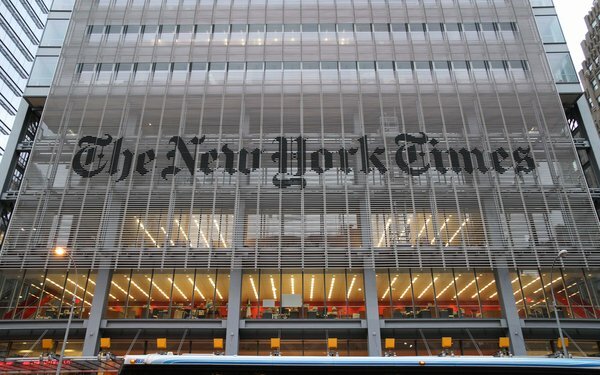 The agency argues in new court papers that the data sought by The New York Times -- including IP addresses associated with comments -- would compromise commenters' privacy. The FCC also says it can't provide the information sought by the news company without undertaking new research. The FCC's papers come in response to a lawsuit filed last September by the Times, which is investigating possible Russian meddling in a proceeding that resulted in the repeal of the Obama-era net neutrality rules. Those regulations prohibited broadband providers from blocking or throttling traffic and from charging higher fees for fast-lane service. FCC Chairman Ajit Pai proposed revoking those rules in April of 2017. That proposal drew a record-breaking 22 million comments, but they were submitted under fake names, or by Russian bots. The precise number of fake comments is unclear, but around 450,000 came from Russian email addresses. The Times is seeking IP addresses, timestamps and user-agent headers — which could provide information about commenters' browsers — for all public comments regarding net neutrality submitted between April 26, 2017 and June 7, 2017. The newspaper argues it's entitled to the information under the Freedom of Information Act. The FCC says it's entitled to summary judgment on the grounds the information is exempt from FOIA laws, arguing the agency's comment system isn't configured to provide that kind of data. “FOIA does not mandate agencies to undertake these tasks to satisfy a FOIA request,” the government argues in a request for summary judgment filed last week with U.S. District Court Judge Lorna G. Schofield in the Southern District of New York. The agency also says turning over IP addresses and time stamps could violate the privacy of commenters. “The New York Times itself has stated it will perform an analysis aimed at linking information provided by the FCC’s FOIA response to specific ECFS comments, which are publicly available and include the names and postal addresses entered by members of the public who submitted comments,” the FCC writes. “Thus, if the agency produces personal IP addresses with the time stamp of a user’s request, there is a substantial possibility that The New York Times or any member of the public could match at least some of those IP addresses with individual commenters who made submissions to ECFS during the requested period, by looking up the public comments,” the agency adds. The New York Times is expected to respond to the FCC's argument by April 11.